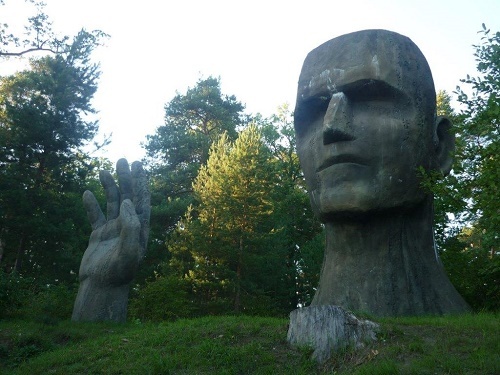 Kolokshinsky graven image, like Moai of Easter Island, stands on the edge of a dense forest, not far from the banks of the river Klyazma, in Vladimir region. According to local legend, Kolokshinsky idol – a monument to the drowned in the river Klyazma. In general, this weird and even frightening sculpture depicts three fragments of the human body of giant size – head, hands and foot. … Giant hand protruding from the ground, in a farewell gesture waves to passing by the living … . But especially creepy the giant looks in the sunset, as a reminder that people, each in his own time, will find their last shelter in the earth. The unknown author made the monument of pure concrete with an imitation of wood texture. Since the monument is located near the village of Koloksha, it bears the name – Kolokshinsky istukan. Its height is a little less than three human growth. In addition, at the back side of giant head is a sign that explains the cause of death. Three semi-circles symbolize the Shield of the Trinity, and the triangle in the middle symbolizes the water. 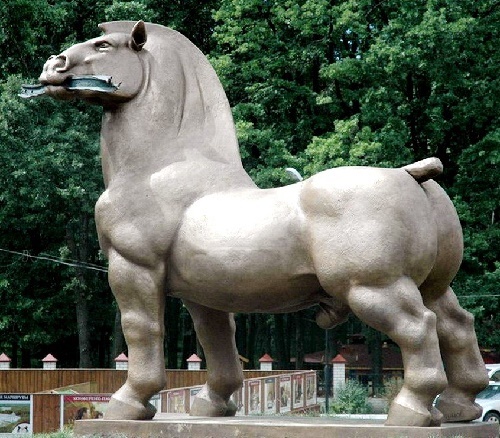 However, according to those who don’t believe in mystic origin of the monument, it appeared on the territory of the sanatorium “Rublevskie Zori” specifically to attract tourists. These creepy sculptures stand along the road going from Imatra in Savonlinna, in Finland. The most interesting is the fact that they have human teeth. 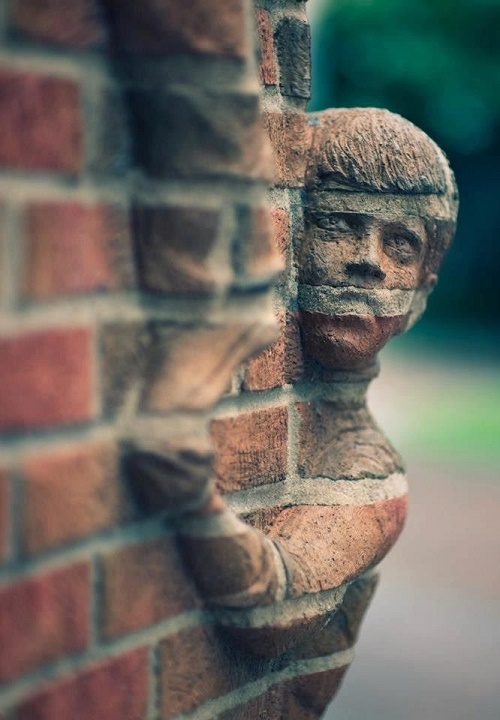 The maniac sculptor is unknown but the fact of creation is evident. Since the artist is unknown, there’s a suspicion that somewhere, near the road lives a dentist with artistic talent of a sculptor. And, as it has become later known from some sources, the sculptor is not a maniac at all. In fact, he is a Finnish self taught artist Veijo Ronkkonen (born 1944), who lives in Parikkala, less than a kilometer from the Russian border. He began using dentures in his figures in 1976; ‘Javelin Thrower’ flaunts the false teeth of the artist’s father, who died in 1975. Visitors have since donated dentures to be used in Ronkkonen’s work. They say that since the immemorial time hell witches organized here their peers. Even the most important witch Rage, happened to appear at the annual Sabbath in honor of the shortest night. Witches can not only frighten or intimidate, but also send drought, rain or hail, eclipse the sun, and turn a man to stone … This place is special, just the brink of a mystical and real worlds where fantasy comes, awakening creative forces. Jonas Stanyus, Juodkrante forest ranger – once feeling this atmosphere, thought: why not to depict characters of fairy tales and legends that existed centuries in folklore. So, in 1979, the Lithuanian folk artists – carvers and blacksmiths – the first time gathered on the hill. They created a gallery of 25 folk sculptures. The following year – another gathering, and a year later – the third. Until now, almost every year the hill attracts the masters, who restore the old sculptures, and create new ones. 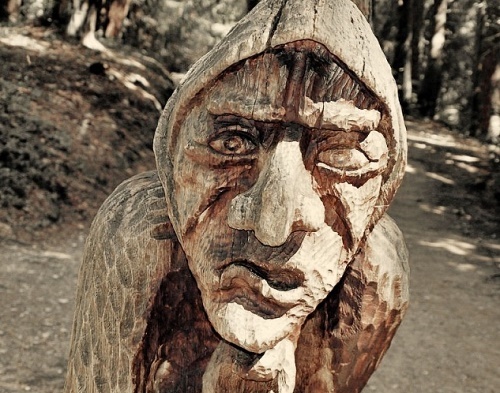 And to this day, it is a solid legacy – more than 80 sculptures from oak with metal detail – a gift of folk artists to the town of Juodkrante, Lithuania and to everyone who has ever been on the Hill of Witches.